I love stories. I love hearing good stories and I love telling stories. I can still remember my unbounded delight when my elementary classmates enjoyed hearing installments of my magical sagas. And these days I love the moments I steal from work to write stories of fantastic islands for my favorite young people. Stories take me away from everyday struggles and allow me to live in my childhood imagination. 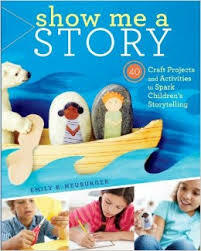 So it should not be surprising that a friend recently sent me a message saying, “You need this book!” referring to Emily Neuburger’s Show Me a Story. She was right. Show Me a Story is full of art activities to help children begin, develop, and play with stories. 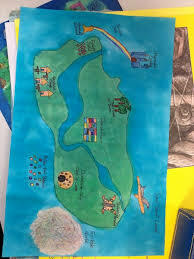 My friend was sure that I’d want to try the Story Map activity, mapping my imaginary islands for story telling. She was right about that, but I’d also love to try some of the other activities. How about making story disks, with pictures of interesting characters, places, and things, to help generate new story ideas? Or how about making a storytelling jar, creating a miniature landscape for story possibilities? Or full sized story sets for improvisation? You might want to create stories on the spot with a storytelling game, or build story timelines to practice sequencing. Some of Neuburger’s activities are best suited for home, working with one child at a time, while others are easily adapted for classroom use. However you decide to use it, if you want to help children tell stories and find joy in the process, Show Me a Story will help. It is nice to have friends who know me so well!